AWP Computer Services is a small IT business, based in Preston, Lancashire, who’s aims are to provide a fast, friendly, personal and reliable service to both small businesses and residential (home based) users of Computers, Windows systems and Android devices in the local area. AWP Computer Services’ primary focus is providing professional IT support to new, small and growing business based all around Lancashire. This includes on-site hardware support, and both on and off site software support. As well as providing services to help your business get the best from its IT affordably, we are focused on helping our customers make the right, most cost effective decisions about how to harness Information Technology to take their business forward. Through a combination of consultancy and ‘hands on’ IT support, we can help your organisation make the best commercial decisions and develop a sensible IT strategy. Our work for small businesses includes data management, back up strategy, disaster planning and recovery, Google Apps for Work and Microsoft Office 365. AWP Computer Services is run by Ashley Preston who has many years experience gained from working in various roles within the IT (Information Technology) industry. Based in Walton le Dale, we can provide support for Business and Home based computer users in the South Ribble and Preston areas. This includes, but is not exclusive to Bamber Bridge, Broughton, Buckshaw Village, Chorley, Clayton le Woods, Clifton, Darwen, Euxton, Fulwood, Hoghton, Hutton, Kirkham, Leyland, Longridge, Longton, Lostock Hall, Penwortham, Preston, Ribchester, Walton le Dale, Warton and Whittle le Woods. AWP Computer Services currently support a number of Businesses in Lancashire. Our clients work in various industries, including retail, eCommerce, accountancy, legal profession, architecture, quantity surveying, project management, public sector tender advice, engineering and home care providers. To learn more about some of our typical customers, please visit our clients page. AWP Computer Services is a member of the North & Western Lancashire Chamber of Commerce, whos 1,600 members provide well over half the private sector jobs in the local area. 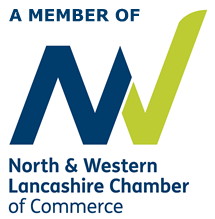 The North & Western Lancashire Chamber of Commerce provides a wide range of business services including; business information, business networking, training, seminars, international trade services, business information tools, legal advice and HR services. North and Western Lancashire is a thriving, vibrant and dynamic location for businesses to prosper. The Chamber of Commerce is an important part of the regional business community because of its strong membership base and the range of services it offers. This makes the Chamber the most effective independent business support organisation in the region. Ashley is also a member of the Central Lancashire Business Clublocal business networking group. The Central Lancashire Business Club membership is open to, small to medium enterprises, micro businesses, people starting out in business and larger organisations, in fact all types and sizes of business based in and around Central Lancashire. The Central Lancashire Business Club is funded by subscriptions and run by CLBC members, for members. This enables it to operate independently although strong links with Local Enterprise Agencies, Business Link, the Small Business Service and Local Colleges are actively maintained. The Central Lancashire Business Club organise a number of social events throughout the year. Included in their annual programme are an annual Wine Tasting event and Christmas Dinner – as well as their monthly member networking meetings, which are generally held on the 1st Tuesday of each month. CLBC monthly meetings generally have a guest speaker, followed by an opportunity for questions and sometimes a ‘workshop’ on the topic. The CLBC try to provide a forum for members to network, discuss matters affecting their business and benefit from the knowledge of a wide variety of speakers. Ashley started work in the Manufacturing Industry as an Apprentice Mechanical Engineering Technician. During the 1990s computers became prevalent in this industry, as in many others, and skills such as CAD(Computer Aided Design), Computer Networking and Word Processing became necessary. After gaining IT experience working with CAD systems, such as IBMCAD and AutoCAD, along with Windows Operating systems and networking, Ashley’s career naturally progressed away from Engineering. Before the end of the 90s he was seconded onto a Business Process Reengineering project, which included the implementation of an ERP (Enterprise Resource Planning) software system, namely Sage Tetra CS/3. After the successful implementation of the CS/3 ERP software, and gaining experience in HTML along with Web Design by producing ‘in house’ training and support pages for the Tetra software on the company intranet, Ashley moved on to form a web development agency. During his time working for and running the web agency (Progress 7 Ltd) he also gained experience tutoring on the subject of the Internet and Web Design at local colleges, such as Runshaw college. Prior to starting up AWP Computer Services in 2012, Ashley spent eight years working as a Web Consultant, IT trainer and Web Account Manager at a Chorley based Mail Order Software systems provider. During this time he gained more experience with Windows systems, Server technologies, Web technologies, Internet security and Office systems. In a hands on, training provision, managerial and technical sales role, Ashley helped to provide support for customers based all over the UK who used the company’s software to trade online. Actually, a number of Ashley’s interests away from AWP Computer Services still involve computing. It’s a hobby as well as a profession. However, when not behind the screen, keyboard or the inner workings of a computer, he enjoys listening to music, he pretends that he can play the bass guitar and is a keen recreational cyclist. Ashley is currently the Vice Chairman of a long established local cycling club, Ribble Valley Cycling and Racing Club, and manages much of their digital presence, via their web site, Facebook page, Strava group and Google plus account etc. Ashley has managed two web sites that provide information about the local area around Walton le Dale, where AWP Computer Services are based, for a number of years now. The Walton le Dale web siteprovides details about local business, community projects, local history, local news & other useful local information. The other is an unofficial web site for the Capitol Centre Retail Park, which is located in Walton le Dale. AWP Computer Services are also currently providing voluntary IT Support (including help with their IT systems & Web Site) to a local charity, Homeless Hounds, who are involved in the rescue and re-homing of stray & abandoned dogs across the county of Lancashire. As part of their fundraising activities, Homeless Hounds run Briarcliffe Kennels as a not-for-profit business.